Tuscany offers attractive over sized guest "Suites". Each suite is situated in a lovely European setting that offers a great sense of relaxation and privacy. Our suites are significantly larger than average hotel rooms and are offered at extremely affordable rates. Each guest suite also has access to complimentary 24-hour valet parking, concierge service, room service, same-day laundry, and dry cleaning. Various fun and exciting slot, video poker and video keno games. 100% Ticket in - Ticket out for quick and easy credit redemption. Over 200 exciting penny games. With multi denomination and multi game features you can play up to 10 games on one machine. Loose slots and video poker machines! We stand behind the claim. The odds are in your favor at Tuscany. Spacious casino floor - lots of room between seating and walkways. Sophistication and Style await you in our friendly casual atmosphere. Tuscany's sense of relaxation is scattered throughout the 27-acre property with plush landscaping. Don't forget to enjoy exotic cocktails and light fare out by the pool. 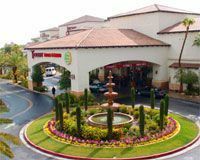 The Tuscany Events Center features over 37,000 square feet of space ideal for accommodating a wide variety of functions and events from 10 to 1000 attendees. Several of Tuscany's function Salons feature a beautiful Tuscan style terrace overlooking the magnificent lagoon-style pool deck. Tuscany's professional staff is always on-hand to ensure your events are a success; state-of-the-art audio visual equipment is available on-site for all your business presentation needs. Whether you are planning a traditional business gathering or a glamorous social affair, Tuscany will custom tailor your event to suit your every need. Social and business gatherings are complimented with a wide range of menu choices customized to satisfy every taste. You can rent a car from our affiliate at Dollar Rent a Car. We have a direct phone on property to them for all your rental needs. The Tuscany gift shop is open daily from 7am until 11pm and has everything you could ever need. From sundries, toiletries, and snacks, to some of the best gift items imaginable to take home to those you left behind. There is also Men's, Women's, and Children's apparel, as well as jewelry, souvenirs, and much, much more.